Ke'eaumoku Kapu and other members of Maui-based Hui O Wa'a Kaulua are building a voyaging canoe and sharing their knowledge of Hawaiian culture with school students. LAHAINA » Ke'eaumoku Kapu said growing up in Papakolea, he had no interest in studying and staying in school. But that changed as he traveled to several Pacific islands* and learned about canoe-building cultures. When he returned, he began sharing his knowledge with youths. "I've experienced a lot and hope to give back what I have to the younger generation," he said. Kapu, 41, is a leader of Hui O Wa'a Kaulua, a nonprofit group that offers youths an opportunity to learn about Polynesian voyaging canoes and Hawaiian culture. Kapu and other members provide an educational tour for students through their facility at Kamehameha Iki Park in Lahaina, where they store a double-hulled Hawaiian canoe and are building a larger one. Curriculum booklets for the group's canoe voyaging educational program are provided by the state Department of Education. The group's 42-foot-long Hawaiian voyaging canoe Mo'olele, built in 1975, is scheduled to replace the former brig Carthaginian in a slip at Lahaina Harbor and serve as a sailing and educational vessel. The Mo'olele has sailed to a number of Hawaiian islands, including Oahu and the Big Island. Kapu said the Mo'olele will not be available for tour rides, but his group will be allowing members who pass its navigational certification course to participate in helping to sail the vessel. 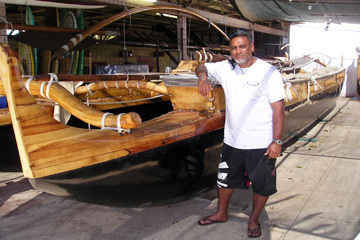 Hui Wa'a is also building the 62-foot-long voyaging canoe Mo'okiha. Kapu hopes the Mo'okiha eventually will travel to other Pacific archipelagos, such as Tahiti, and help youths learn about other Pacific cultures. He said the group is applying for grants and planning to expand its membership to help to raise funds to complete the construction of the Mo'okiha. About 70,000 yards of rope will be used to build the Mo'okiha, Kapu said. But lashing the canoe is an art and requires a perfect tie, and canoe builders will not hesitate to cut away a day's worth of work if a weakness in the lashing is detected. So extra rope is needed -- some 100,000 yards from New England -- and that costs about $4,500. Kapu said there are few Hawaiians with the knowledge of how to make the traditional kind of rope for canoe building, and it would take years for them to make enough rope. Kapu, a former construction worker, said he moved to Maui in 1996 to help his father, who had decided to return to the family's land in Kauaula Valley, south of Lahaina. He said moving to Maui helped to bring him in touch not only with the history of his ancestors who have lived in Lahaina for more than 200 years, but also Lahaina's past and its ties to native culture. Just across Front Street from the group's canoe house is the site of the former Mokuhinia Pond and Mokuula Island, where King Kamehameha I established his residence on the Valley Isle and the capital of the Hawaiian kingdom until the mid-1800s. There is a legend of a lizard goddess, or moo, who lived in the pond -- a story that is also mentioned in the oral history of islanders of Rapa Nui, or Easter Island in the Southeastern Pacific. Kapu said while native Hawaiians did not have the natural resources to make metal implements, they knew how to read the currents and stars and had acquired a knowledge of how to sail thousands of miles across the Pacific Ocean. Inquiries or donations to Hui Wa'a may be made through its office at 525 Front St., Lahaina 96761; or by calling 808-667-4050. » Ke'eaumoku Kapu was not a member of the Hokule'a crew that sailed to Pacific islands, although he has worked with the group. A Page A3 article Monday incorrectly identified him as a crew member.